As far as Prometheus goes, I’m doing an un-review. I say little and there are no real spoilers, period. If you want something more comprehensive scroll down for the Moonrise Kingdom review. I’ll keep this brief. It shouldn’t be discussed unless you’re with people who have already seen it. 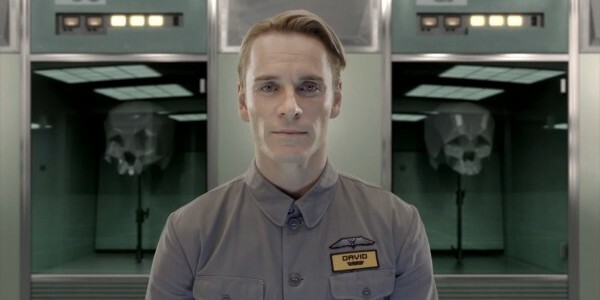 I went to see Prometheus. Spoiler alert: If you’re 8+ months along in pregnancy and you go see it, you will have you kid shortly there after. I’m not kidding, totally happened to a friend of mine (Welcome, new baby Kai, to the World and Nerdom!). Other than that, be prepared to leave with a ton of questions. If you don’t walk out with at least some questions that spawn (get it?) into more questions, then you’re doing it wrong. David. Focus on David and his agenda. I’m not a huge Alien (or Aliens or Alien Resurrection or Alien 3 or Alien vs. Predator or Alien vs. Predator 2) fan, but I do love Sigourney Weaver, puzzles, and science fiction. No, Sigourney wasn’t in this one, but I still found it to be entertaining and interesting. I’m hoping many of my questions will be answered in the sequel, Paradise, that we probably won’t see before 2014. It’s gross, it’s phallic, it’s spacey, it’s Ridley Scott. Go see it. It’ll be fun. There’s not much else on Netflix anyway. I love Wes Anderson. I love his usage of color, his need to show viewers that it’s okay to love and lose, that the more we care the more painful it is in the end. His long shots, his simplicity, and always, always his choice in music. Moonrise Kingdom starts off much the same of his other films, the classic songs, the endless single shot that reveals a lifestyle, and blocked colors, beautiful, bright, setting our mood and the tone of his story. Suzy is a twelve year old girl feeling troubled. She’s on the cusp of womanhood, she has no real friends, and her mother and father, lawyers with little to no true relationship remaining in their marriage played by Bill Murray and the fantastic Francis McDormand, think her to be troubled as well. Ultimately, however, she seems pretty on the ball compared to most tweens, merely going through all those horrible bits we all had to face. Sam is also a troubled youth of 12, recently orphaned and trying just to fit in where ever he lands while being himself…which is a bit over every one elses’ heads. Both Sam and Suzy are growing up on a small island off the coast of New England, the story focusing on the summer of 1965. Shortly after meeting in 1964, Sam and Suzy become pen pals, sharing much of themselves, trusting only each other with their secrets and childish demons, until finally they hatch a plan to go camping for a few days together. What ensues is the frantic search for the children by the adults in their lives, revealing that youth – even “bad” youth – is always innocent while adults are just hot messes. 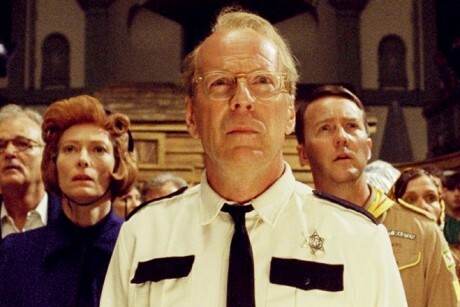 Bruce Willis plays an wonderfully thoughtful and patient policeman, with Edward Norton as a stiff Khaki Scout leader who really wants to be the Dudley Doright of his troop, and Tilda Swinton as the heartless, frigid Social Services. The shooting locations were primarily around Rhode Island and Jamestown, absolutely beautiful settings made all the more breathtaking through Anderson’s shooting style, that made me ache for my own childhood. The story itself was interesting and entertaining, but not very thought provoking. It was as if watching a very well written and enjoyable young adult novel. It was a bit funny, a tiny bit heartbreaking, but more than anything it was relatable on a very real level. We were children once, or we have them now. It’s what we went through, what we feared, what we worry about today, and it’s a pleasure to watch. We’ve all felt left out, odd-balled, or worse – doing whatever we had to in order to be a part of the group. Moonrise Kindgom touches on this unabashedly and goodness wins the day. Each primary adult in the film was dressed to their own accord. The policeman and savior in white, the Khaki leader in starched tan, Social Services in harsh navy like the turbulent sea, Suzy’s father in aged sweaters and mismatched pants while his wife dresses almost too young for her age, signifying blatantly what their marriage had become to each. The Narrator is always in red, and adorable. This aided in the story telling aspect and was somehow refreshing after all the overly stressful movies, TV shows, and news that air nightly at home. 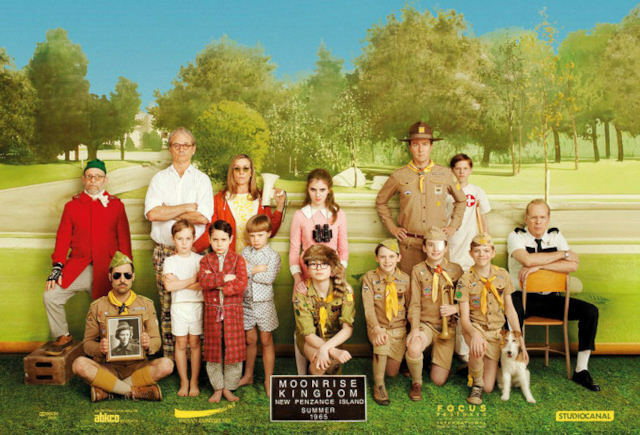 Moonrise Kingdom is simple and lighthearted in it’s writing, a wonderful interlude between the usual deeper fare, missing even the minor politics and family struggles that Anderson’s previous live-action works delved into. It’s filled with his usual honesty for the beauty we may be missing and the ugly that we sometimes prefer to ignore, flows comfortably, and is extremely entertaining. I in no way mean to intend that in being less complex than, say, Royal Tenenbaums or Rushmore this film lacked anything; it was merely a sweet story, simply told, with all the visual delight Anderson always brings to his films and was very endearing. It’s very enjoyable, and everyone in it, including to new-comers to the screen Jared Gilman and Kara Hayward, are wonderful, though my favorite ma have been the minor role played by Jason Schwartzman; the narrator, played by Bob Balaban, was also hysterical. Gilman and Hayward encompass Sam and Suzy, playing with raw innocence, and the kind of awkward determination that only children can possess. Their characters were imperfect, the actors themselves perfect, making the viewer remember, at times uncomfortably, exactly what those years of life were like. I recommend Moonrise Kingdom for the Wes Anderson fan or those just searching movie theaters for a more upbeat alternative to Spiderman, Prometheus, or Avengers. It’s summer, but we don’t have to to have Action Flick boners to see an excellent film. And you don’t have to take my word for it: Moonrise Kingdom got a 95% on RottenTomatoes! It’s funny, a good date movie, and a great summer flick when you get tired of gratuitous explosions, films that cost hundreds of millions for no obvious reason, and bloodshed…though Moonrise Kingdom has that, too. This entry was posted in Comedy, Entertainment, Pop Culture and tagged bill murray, Bruce willis, moonrise kingdom, prometheus, review, ridley scott, science fictionm, sequel, spoiler, synopsis, wes anderson, young adult.